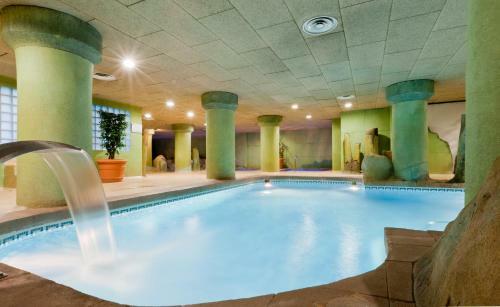 Situated in the modern center of Granada, the Senator Granada Spa Hotel is close to the Palacio de Exposiciones y Congresos and offers body treatment facilities, a steam bath and a spa & wellness centre. The Senator Granada Spa Hotel offers a convenient 24-hour reception as well as facial treatments, a currency exchange and meeting rooms. Business travellers will appreciate the quality and range of amenities offered. Business amenities at the hotel include function rooms and a business centre. Every comfortable room at the Senator Granada Spa Hotel includes a private bathroom, a mini bar and a pillow menu. Cable / satellite channels, tea and coffee making facilities and a hair dryer can be found in each room of the hotel. There is also a CD player and a radio for guests’ entertainment. The Senator Granada Spa Hotel offers a convenient on-site café. The hotel's spacious restaurant is open for breakfast. Many other dining options are offered within a short stroll of the hotel. The location of the hotel allows guests to easily access multiple tourist attractions by foot. Generalife is around a 20-minute car ride from the hotel. This hotel is 1727 metres from the Alhambra entrance, 1286 metres from Plaza Nueva (the absolute centre of Granada), 2291 metres from the train station and 3944 metres from the bus station.